One of baseball’s greats decided to call it a career. Carlos Beltrán announced his retirement after 20 MLB seasons last Monday in a post entitled "Muchas Gracias, Béisbol." This comes at the heels of Beltrán helping the Houston Astros win their first World Series title in franchise history. At 40 and with plenty of miles on his body, Beltrán walks away after winning the only championship of his career. He played most of his career as an outfielder but spent the last few seasons as a first baseman and designated hitter. Beltrán finishes with a career slash line of .279/.350/.486/.837 and has also established himself as the latest in the long line of great Puerto Rican players. Born in Manatí, Puerto Rico, Beltrán was selected by the Kansas City Royals in the 1995 Major League Baseball Amateur Draft. He made his big league debut in 1998 despite never having played at the AAA level in the minor leagues. With the Royals he was paired with greats such as Johnny Damon and Mike Sweeney. Management believed that Beltrán was the missing piece needed to get the team back to its glory days of the 80’s and early 90’s. Despite averaging 20 home runs and 100 RBI’s between 1999 and 2003 (and winning American League Rookie of the Year in ’99), the Royals failed to reach the postseason. So midway through the 2004 season the Royals decided to rebuild and thus traded Beltrán to the Houston Astros who were in the National League at that time. In 2004 Beltrán got his first taste of the postseason in his first go-round with the Astros who made it all the way to the National League Championship Series before being eliminated by the St. Louis Cardinals. He set a then-playoff record by hitting at least one home run in five straight playoff games that year. In 2005, Beltrán signed what is now the third-richest contract in New York Mets history when he was given a seven-year, $119 million deal. He played with the team through 2011 and at the time the Mets were trying to put together an All-Star team that also featured fellow Puerto Rican Carlos Delgado, as well as legendary Dominicans Moises Alou and Julio Franco among others. Injuries to many members of those Mets teams, including Beltrán, limited them to just one playoff appearance (2006) and Beltrán was traded to the San Francisco Giants to finish the 2011 season. Just before the 2012 campaign Beltrán signed a two-year deal with the St. Louis Cardinals. He made back-to-back playoff appearances for the first time in his career which included his first trip to the World Series in 2013. After the Cardinals lost the Fall Classic to the Boston Red Sox, Beltrán hit free agency once again. In 2014 he found himself back in New York, this time with the Yankees. He signed on for three years, made the playoffs again in 2015 (though lost the Wild Card game to Houston who’s now in the American league). But injuries and age caused him to move from the outfield to first base. In August of 2016 the Yankees traded him to the Texas Rangers where he would finish the year as the team’s designated hitter. This past season, Beltrán signed a one-year deal to return to Houston where he was the DH for 107 games. 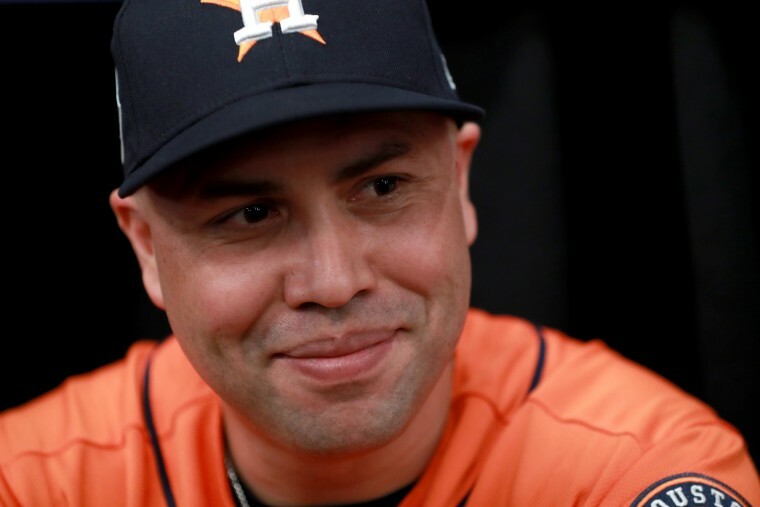 He gave the young Astros veteran leadership as they had their first 100-win season since 1998, and cruised through the playoffs en route to their first world championship. Beltrán finishes his career with 2,725 hits, 435 home runs, 1,587 runs batted in, 1,582 runs scored, and 312 stolen bases. Had it not been for those injuries during the latter part of his career, he could have reached the 3,000 hit/500 home run club. Nonetheless, his numbers are impressive. Beltrán is also a nine-time All-Star, three-time Gold Glove winner, two-time Silver Slugger Award recipient and a member of baseball’s 30-30 club. He also won the Roberto Clemente Award, "which is the greatest honor I could have ever received as a ballplayer," he said in the post announcing his retirement. In addition to his success in Major League Baseball, Beltrán has also had success in the uniform of his homeland. He suited up for Puerto Rico in all four editions of the World Baseball Classic in which he went a combined 30-for-95 at the plate with 3 home runs, 14 RBI’s, 7 doubles, 2 stolen bases, and 17 runs scored. Puerto Rico made the WBC finals in both 2013 and 2017. Beltrán will be eligible for the Hall of Fame in 2024 and with his resume he should get in on the first ballot. Beltrán has also been very active with charity work, especially when it comes to hurricane relief for Puerto Rico. Now that he’s retired, he’ll have more time to dedicate to those efforts.